Putting your storage to the test – Part 1 iSCSI on Iomega StorCenter IX4-200D and part 2. Recently Iomega sent me their new StorCenter PX4-300R for testing purpose and I was happy to run some Iometer stress tests on it. 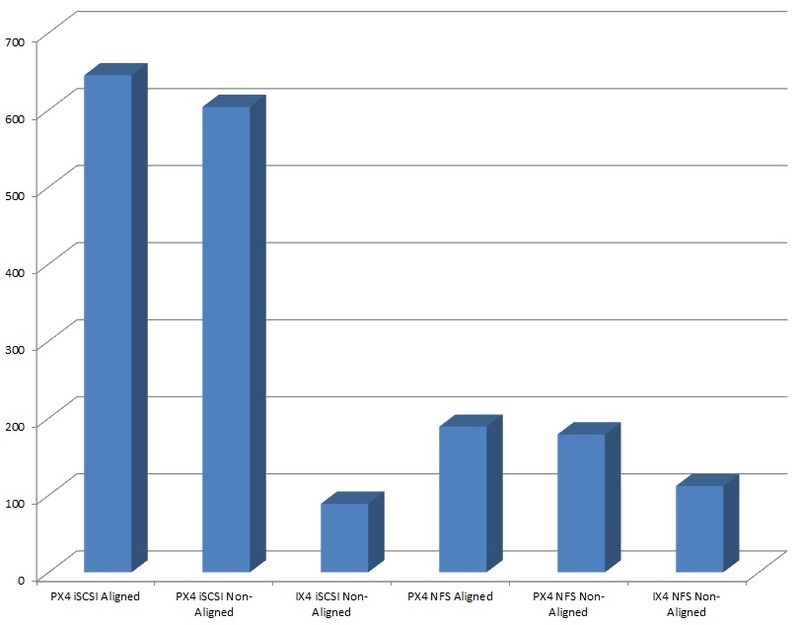 I was very anxious to learn if the PX4 would be able to outperform the “good old” IX4. The PX4-300R is a rack mountable model of 1U height and comes with rails and the necessary power and UTP cable. When I read the several websites where the unit is sold, it normally comes without disks. The unit I received had four Hitachi 2.0TB HDS723020BLA642 disks in it configured in RAID5, giving me 5.4TB of disk space. Setup is easy, you plug the UTP cable and power cable, boot the unit and check your dhcp server to see what address it picked up. Then there is a web interface that gives you all the management options you need. Despite many features the PX4 holds, I was most interested in the performance of this thing. In the 5.4TB volume I created a big NFS volume and a 500GB iSCSI volume. Connected my vSphere5 ESXi hosts to it and moved my performance test VM on to the volume. This Windows 2003 VM is running on HW level 7 with 1 OS disk and a 20GB test disk (all VMDKs of course). The first set of test where run with a non-aligned disk, it was formatted in Windows 2003. The aligned tests where run with a disk formatted by Windows 2008 and then reattached to the Windows 2003 server. For testing I used Iometer with the same config file I ran my IX4 tests, it creates a 4GB dummy file on the disk and performs the reads and writes on that dummy file. 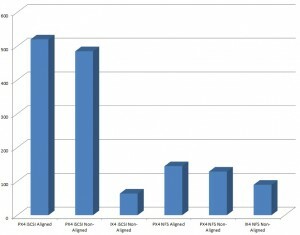 When looking at the results, it clearly shows the PX4-300R is running circles around the IX4. It also shows that for the PX4-300R iSCSI performs a little better than NFS, which was completely different for the IX4 that showed a clear advantage for NFS over iSCSI. 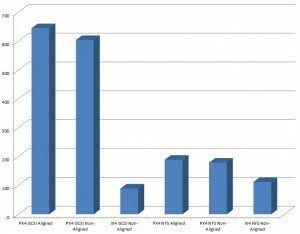 When looking at the charts it is clear that the PX4-300R performs much better than the IX4, sometimes up to 7 times faster. 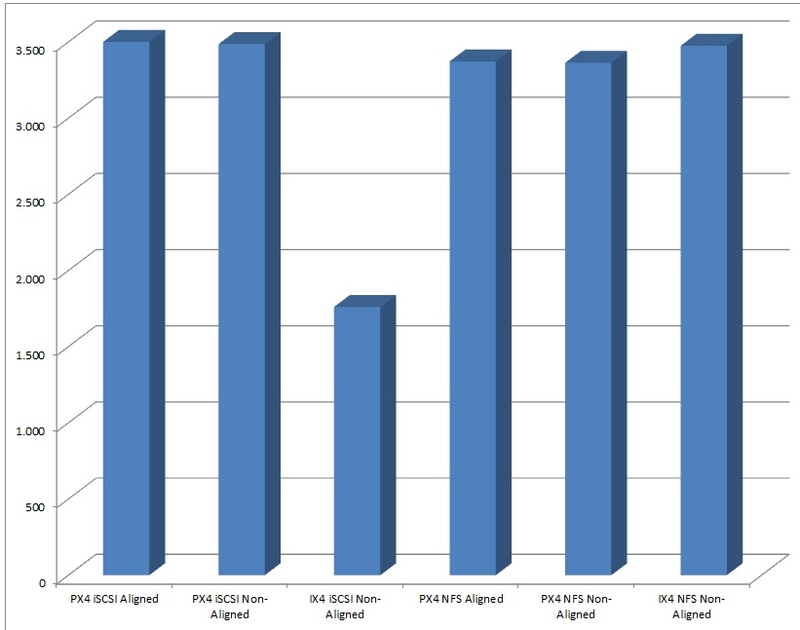 It is good to see that iSCSI and NFS perform almost equal on read performance but surprised to see that NFS can’t keep up with iSCSI in ‘real-world’ tests. Running the tests doesn’t take that much time so I decided to also check if partition alignment would really make a difference by formatting one disk with Windows 2003 and one disk using Windows 2008. In Windows 2008 partitions are automatically aligned when formatted. As you can see from the results there is a clear difference between aligned and non-aligned partitions. For heavy read the difference isn’t that big in percentage, but still a 100 IOPS, for the other tests you can see a difference of between 5-7%. That’s free IOPS you get back when making sure you align your partitions. For the workload I would like to use it for, which is running as my homelab shared storage and store some video’s and foto’s, this would make a great NAS. It holds a number of other features as well, like automatic RSYNC of files to other rsync enabled devices, syncing with cloud services and creating a personal cloud. But I don’t care so much for them personally. What I find important is that it feels fast, almost like I’m working on enterprise storage. Of course it can’t compete with enterprise storage but with the few VMs running in my lab, this is great stuff. 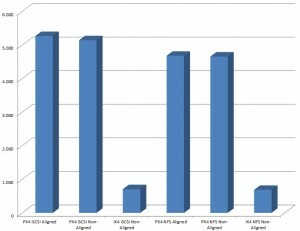 The PX4 is more expensive than the IX4, but then again it performs up to 7 times faster in some tests. For a complete overview of the different products, see the Iomega Network Storage overview page. If you want to perform these tests your self, you can download this Gabes-PerfTest.zip which includes iometer and the test configuration file. Would be great if you post your results in the comments. performance, storage, VMware iomega, iomega storcenter, iscsi, ix4, ix4-200d, nfs, performance, px4-300, px4-300r, storcenter, VMware, volume. permalink.